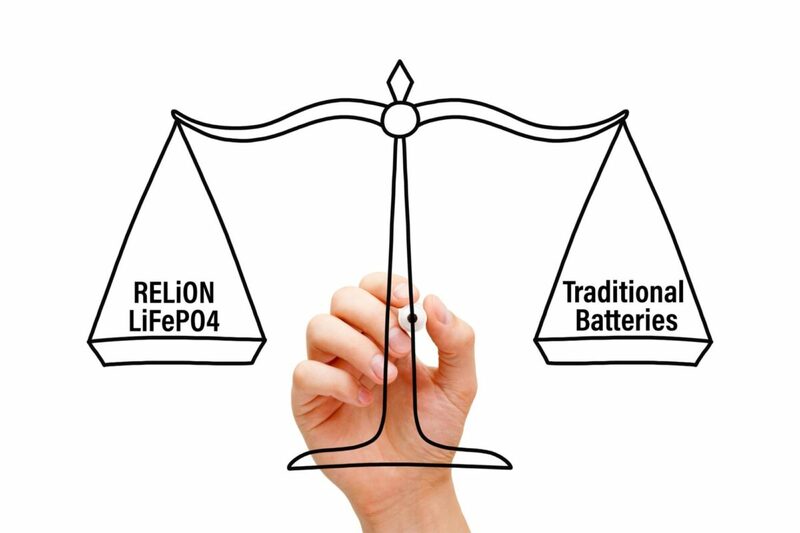 Compared to lead-acid batteries, RELiON’s lithium iron phosphate (LiFePO4) batteries offer users practical advantages such as lighter weight and hands-off operation. These batteries also have longer lifetimes which makes for far less frequent battery replacements and service calls. But many first-time buyers of LiFePO4 batteries wonder if their higher purchase price compared to lead-acid batteries makes sense in terms of total cost of ownership. Do LiFePO4 batteries cost more, or less, than lead-acid batteries over their operation lifetime? 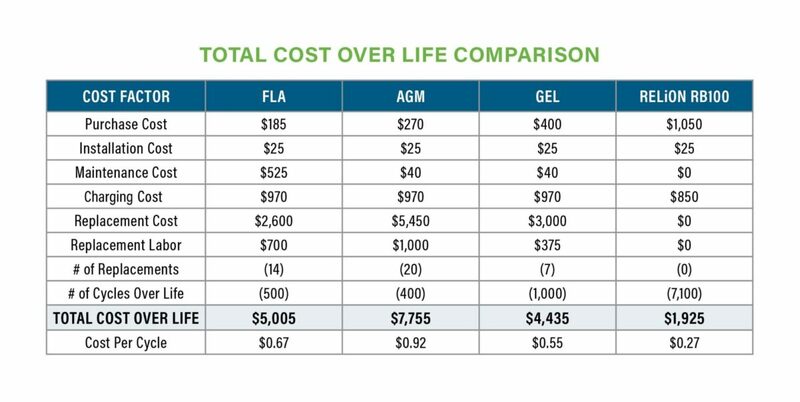 In this article, we present the results of a simple calculation that compares the total cost of ownership of a LiFePO4 battery compared to three competing lead-acid technologies. Initial cost of the battery. The up-front retail cost of the battery, the largest cost of initial installation. Labor cost of installation. A nominal cost of installing a battery, often performed by a skilled technician who in some cases must be scheduled and dispatched to the customer’s site. This cost is approximately the same for each battery type, however, the process must be repeated multiple times with lead-acid batteries over the life of a single LiFePO4 battery. Labor cost of maintenance. In the case of flooded lead-acid batteries, for example, this includes checking and topping off water levels and cleaning acid residue off the battery, and often the surrounding area, as well as cleaning and/or replacing nuts and bolts and cables that have become badly corroded. Lithium-ion batteries require no maintenance during their lifetime. Battery replacement costs. Includes a new replacement battery plus the cost of removal and installation by a qualified technician. Cost of charging. The nominal cost of electricity for charging the battery. It includes the need for overcharging lead-acid batteries to avoid stratification (the accumulation of lead sulfate on the battery’s plates). In our calculations, we assumed a DOD (depth-of-discharge) of 80% on all batteries before recharging was necessary. Along with the initial cost of the battery, perhaps the most critical factor in estimating the total cost of ownership is the specified lifetime of the battery in terms of the number of cycles until end of life. For our calculations, we took end of life to be when each battery fails to deliver 50% of its initial capacity for lead-acid batteries and 70% for LiFePO4 batteries. The table below shows the retail price and expected number of cycles until end of life, taken from retail websites and the manufacturer’s published data sheets, of the four batteries used in this analysis. The total cost of ownership of each battery was calculated over a single lifecycle of the RELiON RB100 since it has the longest life of all four batteries. Each of the three lead-acid batteries requires multiple replacements over the life of the RB100. For this calculation, we assumed an electricity cost for charging of $0.12/kWh, battery maintenance costs of $10/hour, and installation and replacement costs of $25/hour. The table above shows each factor in the overall total cost of ownership for each battery as well as the total cost of each battery per cycle. Based on the specified lifetime of each battery and their retail prices, it’s clear the total cost of the RELiON RB100 battery is far less in terms of each cycle and in terms of the overall cost of ownership. While the lead acid batteries have a far lower up-front cost, they require frequent replacement. The FLA batteries required 14 replacements, the AGM required 20 replacements, and the more cost-effective Gel batteries still required 7 replacements over the life of a single RB100. RELiON’s long-lived LiFePO4 batteries reduce the inconvenience and expense of replacement and service calls, and they lend peace of mind to many users when it comes to demanding applications. As this article shows, LiFePO4 batteries are also beneficial to the bottom line. Our calculation compares the total cost of ownership of RELiON’s RB100, a 12V 100 Ah LiFePO4 battery, to three equivalent size (BCI Group 31) off-the-shelf lead-acid battery technologies. Using measured lifetimes taken from the manufacturer’s published specifications of each battery, our analysis shows that the RB100 costs at least 51% less over life than even the most cost-effective lead-acid battery. Interested in learning more about the RB100? Check out our product specification page. on your TCO table for RB100 from your page, can I request for the same table but using RB40V200 and V300? I am already talking to your UK agent DBS Leoch Ltd with a view of purchasing 4x12v120 Insight Lithium Phospate batteries when they arrive into the UK in 4 weeks time. These are to replace my 2x80 Ah lead acid batteries for my yacht. However I should be grateful before making this purchase if you could confirm the following points. 1. The space these Insight batteries are to be installed is only 9.5" high therefore I would need to install them in parallel on there side (width 7.1") - is this acceptable without causing any damage or performance loss? 2. I have a solar panel system currently charging my lead acid batteries through a Victron Energy Blue Power regulator, will this still work with the Insight batteries? 3. I have a Nasa Marine BM-1 compact battery monitor - will this work with the Insight batteries. 4. I have an anchor windlass using approx 120Ah and a lifting keel motor using approx 70Ah, when operated each will run for approx 30-40 seconds at a time. 5. I have a Cetrek battery charger at present but it is only rated at 6 Ah trickle charge. Can you give me a recommendation what is best as I am sure this is too small.